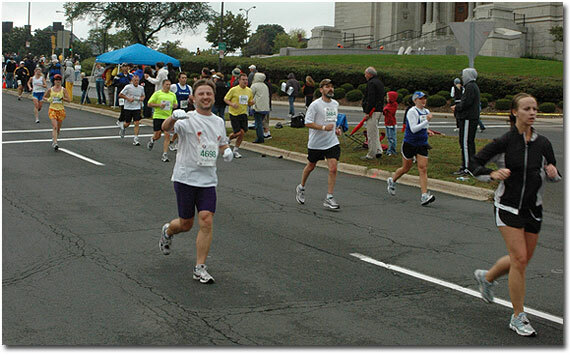 Last Saturday, I participated in the 2008 Team Ortho Monster races in Minneapolis. Distances this year included the half marathon, a new 10 miler, a 5K and a 5K-K9. I picked the half marathon as a nice follow-up to TCM. The weather was great and the size of the field (1200) made for an uncrowded morning. Until the end, that is. The race starts were staggered, but it seemed like everyone finished at the same time. The line for water and food afterward was dangerously long – glad no one passed out. I also encountered lines at Marathon Sports on Friday during packet pick-up and the organizers ran out of hats, which they said will be mailed. A friend of mine said there were issues with shirt availability on Thursday too, which seems weird for a group that has been doing this for quite a while. 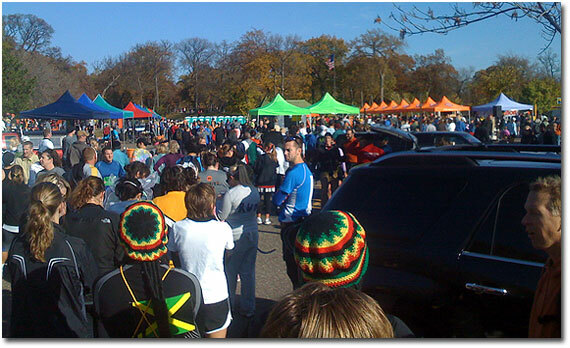 This was my first time running this 13.1-mile course, which started and finished near the Lake Harriet band shell. The course wrapped around both Harriet and Calhoun, with an out-and-back stretch along Minnehaha Creek thrown in between. Several sections of the TCM course were covered, although often in the opposite direction. Very nice layout overall that helped me set a new half marathon PR with a chip time of 1:51:20 (8:30 pace). Next up: the Walt Disney World Marathon in Orlando – 6 a.m. on January 11, 2009. Finally got to watch my first regular season game in person this year. I didn’t buy the single season ticket next to my relatives seats this year, so unless Bill Robertson comes through for me (or any of the channel 45 connections), I’ll only get to about five games at the X this season. The Wild were extremely fortunate to be where they were after two periods. I don’t buy the consecutive sell-out streak any more and wish they would just announce the true attendance. Programs are still $3 this year, with proceeds still going to youth hockey. They played the cool Andrew Brunette video with him and the equipment trainer, then said they were auctioning off the prop “17,615” jersey. Nicely done. 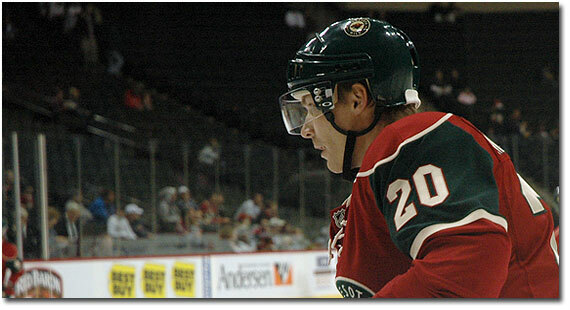 “Mittens” is the worst hockey nickname ever and I refuse to use it. I have a few enhancements planned for this site that I hope to have online very soon – stay tuned! As part of my effort to “de-clutter” my life (and combat current economic forces), I’ve decided to get rid of many of the compact discs we’ve collected over the past 25+ years. For full albums, I’m looking at this service I read about in Newsweek. Before I contact them, I thought it would be wise to have Cheapo’s give me a quote to see if they are a better deal. I’ll update this post with the results. UPDATE: Cheapo’s offered me about the same as the iPod place (~$1/CD), so I just decided to take that offer. As for CD singles, my wife and I have been collecting these from around the world for many years. Some are worth next to nothing, while others may be diamonds in the rough. I used to list on eBay to sell things like this, as that usually provides the best chance to see what an item is really worth. The problem is that it’s a major hassle to take photos and create multiple listings (to say nothing of the costs involved). So I’m trying something new – today I created a database-backed page on this site that lists the artist, title, catalog number, number of tracks and a brief description of the item. If you see something you like, shoot me an email and I’ll give you more information about it. New autograph policy: A total of 150 autograph tickets will be distributed for Andrew Brunette and another 150 for Marian Gaborik. Those tickets will be distributed on a first-come, first-served basis beginning at 2 p.m. The sound was uncharacteristically bad for the State – the first song sounded like we were in a tin can and it was hard to understand what he was saying in between songs. Nice mix of songs on the set list (I’ll watch for someone to post it) – mostly new songs from the latest Byrne-Eno CD along with Talking Heads classics like Take Me to the River, Once in a Lifetime, Heaven and I Zimbra. Not much in the way of David Byrne solo songs, though (were there any?). Nice size musical ensemble on stage (Byrne, three back-up singers, two percussionists, bass and keyboards). While I would rather see Chris, Tina and Jerry up there, this group played well together. LOVED the dueling drums at the beginning of Burning Down the House. The three dancers were a nice addition to the show – fun to watch, yet not too distracting from the songs. One of the three seemed really happy to be up there and her enthusiasm filled the theater. I’m don’t know much about contemporary dance, but my first thought was “wow, this is very New York art scene.” After a few more songs, though, I started thinking that a lot of these moves could have been in Napoleon Dynamite. The group seemed honestly happy about the audience response at the end of each set. I think that helped get us one more song tacked on at the end of the second encore (the haunting Everything That Happens). The crowd was decidedly older than average. I realized on the way out that the first Talking Heads album is now 31 years old, so teenagers then are almost fifty now. Damn. All in all, a very entertaining evening. Come back soon, Mr. Byrne! 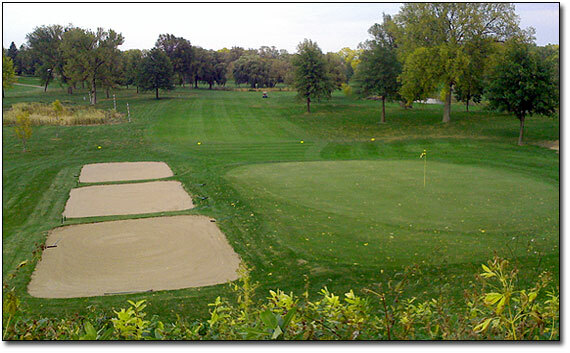 This weekend we visited Meadowbrook Golf Course and found a number of changes–both finished and in progress. Square appears to be in at Meadowbrook – new square bunkers on #15 (see above) and squared-off tee boxes throughout. The back tee box on #16 was being rebuilt (and apparently extended) and the brush behind the eleventh green has been cleared out to give a much improved view of Meadowbrook Lake. The greens were faster than normal, but overall, course conditions were spotty for this time of year. Fall special walking rate of $23 was fair, though. 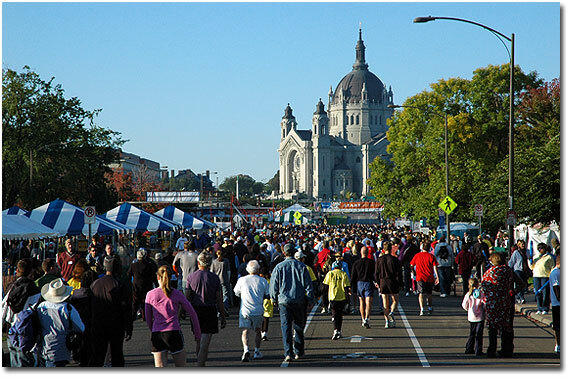 The 2008 Twin Cities Marathon was much cooler than last year, but was also accompanied by way too much rain. I managed a new PR and couldn’t believe how many people still came out to cheer in the unpleasant weather. The 2009 Twin Cities Marathon (the 28th) will be held Sunday, October 4, 2009. I’m a little behind on posting about last weekend, but Twin Cities Marathon weekend was a blast. TCM continues to be one of the best run events in the country – now all they need to do is get USATF to modify their headphones policy and it will be perfect (as Portland Marathon race director Les Smith said in a Pioneer Press story – “what a bunch of dorks”). My kids participated in the family events on Saturday for the fourth or fifth year in a row: the older one in the 5K and the younger one in the one mile. Two things surprised me in the 5K – the winning time of 14:49 was pretty amazing and 11-year-old John O’Hagan of Denver beat the entire women’s field, with a time of 19:18. The expo at RiverCentre was great – quick and easy number pick-up and lots of good vendors and freebies. 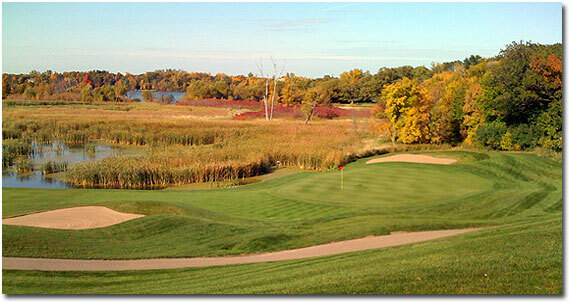 Taking advantage of the late season good weather, we visited the Chaska Town Course on Friday to play 18 holes. The fall special walking rate is $40, which includes a cart after 2pm. Similar to The Wilds, housing has sprung up around this course the past few years. It takes some of the character away, in my opinion, but none of it gets too close to the action to really impact play. This Arthur Hills design has always had unique features, including the drivable par-4 third hole and the picturesque par-5 eighteenth hole. The greens Friday were much faster than I ever remember and the fall colors were spectacular. I always have trouble scoring on this course, but I think I just need to play it more often. The City of Chaska should be very proud of their baby – it’s a gem. 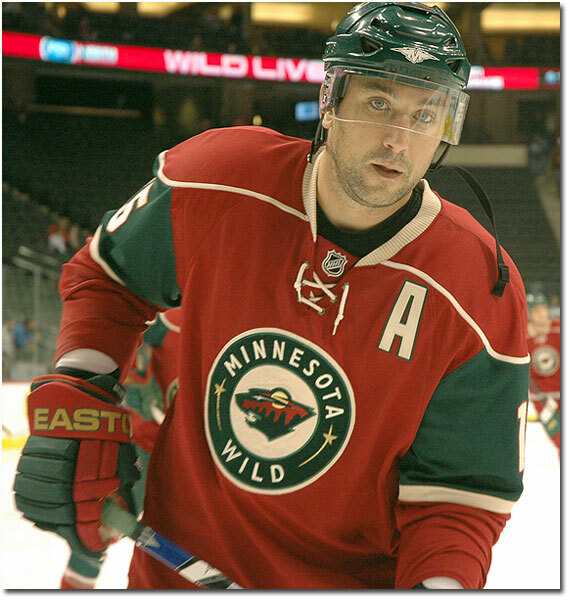 It just seems so right to have Bruno back in a Wild jersey, no? Fun season opener tonight. Didn’t get to see it in person, but watched the beginning at Joe Senser’s in Eagan before heading home to see the end. My trend of getting faster as I get older continues. I set a new half-marathon PR in June and today I broke my marathon PR by almost 30 minutes – 4:13.19. The rest of me feels pretty good after an afternoon of rest. Thanks to everyone who came out to cheer me on in the rain: Alan Page (and his tuba), Mark Nistler, Colleen and the kids (in four different spots), Jean Kane and the Pozarskis and my parents (who brought beef jerky from Greg’s Meats that pulled me through the last two miles). Next up is the Monster Half on Saturday, October 25 in Minneapolis, followed by the 2009 Walt Disney World Marathon on January 11 in Orlando. 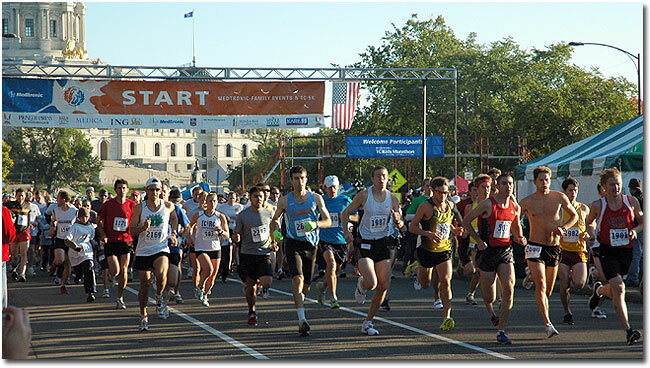 I’m also thinking about the Madison Marathon (5/24/09) and using my automatic entry into the Garry Bjorklund Half Marathon (6/20/09) in Duluth. Nice to finally be back! After a laptop issue that took a long time to resolve, too much stuff going on at work and my general disdain for pre-season professional sports, it’s been hard for me to get excited about hockey this year. That changed after back-to-back games this week at the X, though. As if we needed a new reason to hate Skoula – watch that stick, buddy! One final thought tonight. A lot of season ticket holders for pro hockey and football hate the pre-season because they are not “real” games, yet cost full-price. I think the NFL is considering a shortened pre-season, but I like what baseball does: cheap games in unique locations that people actually plan trips around. How about NHL scrimmages at college rinks for $5 or $10 a head? The teams make too much money under the current setup to change, but wouldn’t it be cool to have the local rink rats get to see their heroes in their own backyard? Green Fees based on outside temperature 1/2 Hour prior to tee time ($1 per degree). The Best Golf Special In Town! Cart Fee only $10 per person (includes range balls)! I think they used to include the cart and range balls, but it’s still a good deal for a great Weiskopf-Morrish layout.